Education Minister clarifies he did not eat non-kosher food after allegations on social media caused a firestorm. 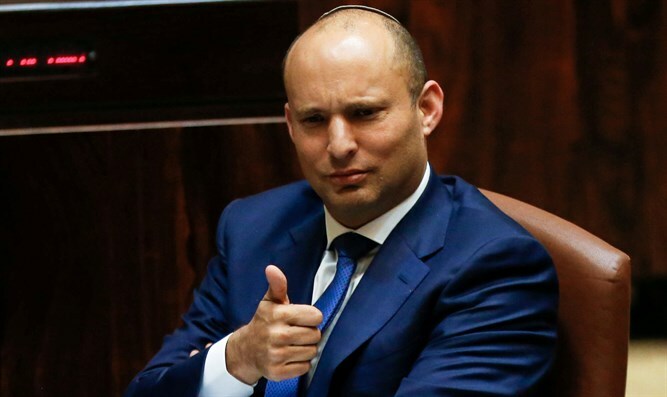 Education Minister Naftali Bennett was at the epicenter of a social media firestorm this past weekend after an Israeli wrote in a viral Facebook post that she had spotted Bennett eating at a non-Kosher restaurant in New York. On Saturday, blogger Ella Sheinwald wrote that she had seen the Religious-Zionist minister eating at the non-kosher dining room at New York's JW Marriott Essex House hotel. "Minister Bennett is sitting next to us now in New York with his wife, eating in a non-kosher restaurant. Bravo," she wrote. "They sat next to us and his bodyguards even filled plates including bacon ... so I do not care at all, they can eat whatever they like but at least Bennett will not be hypocritical. His wife was also with him," she added. The post set off swirling speculation on social media whether Bennett had indeed eaten non-Kosher food, with hundreds of commentators alternately defending him and attacking him. After being queried by the haredi Kikar Hashabbat website, Bennett's office clarified on Sunday that the Education Minister had eaten his own food at the hotel dining room and that only his security detail had eaten bacon. "We regret the desire to slander and spread gossip, this is a story that does not exist," said Bennett's spokesperson in a statement. Many Israeli politicians, even those who are not religiously observant, refrain from eating at non-Kosher eateries when traveling abroad as official representatives of the Jewish State. A similar controversy erupted in 2014 after Prime Minister Netanyahu was spotted eating at the non-Kosher Fresco by Scotto restaurant in New York together with casino mogul Sheldon Adelson. The visit to the eatery had outraged Israel's haredi media, who alleged that "the Jewish Prime Minister Netanyahu dined with Adelson in a pig restaurant". Amid mounting criticism, Netanyahu said that he only ordered Kosher food and reiterated that he takes pains to eat only Kosher food at home and while on official state visits to foreign countries. "I make it a point not only in the prime minister’s residence and at public events, but at private events as well I do not eat non-kosher food," Netanyahu had said. “We uphold the tradition and I uphold the tradition and that is my practice, also as prime minister of Israel, but beyond that, because we hold these customs as a Jewish family."